Description: Allegorical county map of Somerset with the rivers, hills, forests, and cities represented by figures from mythology and folklore. From Drayton's "Poly-Olbion". Description: Beautifully engraved county map with various coats of arms and vignettes including Bath. Rare early edition with Latin text on verso. Description: Early county map of Somerset with elaborate cartouche, and decorative compass rose. 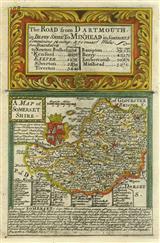 Description: County map of Somerset with beautiful cartouche. French text on verso. Original colour. Description: County map of Somerset embellished with several ships and a sea monster. The dedication is to Sir Maurice Berkeley, Viscount FitzHardinge, who was used a messenger to inform Charles II about the Restoration. Description: County map of Somerset. Text and decorative table informs of distances between towns. Coloured. Description: County map with borders illustrating local antiquities and the Roman baths in Bath. Original colour. Description: Grand map of Somerset with informative and descriptive text. Schematic plan of Bath to the upper left. Original colour. Description: County map highlighting the road network in the county with a small illustrated cartouche on the upper left. Coloured. Description: Attractive copper-engraved county map of Somerset surrounded by descriptive text, a vignette of Bath Cathedral and a splendid cartouche. Original colour. Description: Chart of the Bristol Channel from the Mouth of the Severn at Bristol and Chepstow to the Irish Sea. Description: Charming late 18th Century miniature map of Somerset, including the Bristol Channel. Coloured. Description: Attractive county map of Somerset by the cartographer to the Postmaster General, accurately plotting England's roads. Original colour. Description: Attractive map of the county of Somerset highlighting the developing road network during the Industrial Revolution. Original hand colour. Description: Somerset, divided into hundreds and featuring elegant vignette of St. Vincent's Rock and Hot Wells, Bristol. Original colour.